Elderberry is a locally abundant herb that has traditionally been used for its immune boosting properties. Research has demonstrated its antiviral nature, and its effectiveness for both avoiding and supporting cold and flu. Its dark purple color make it an excellent source of antioxidants as well. 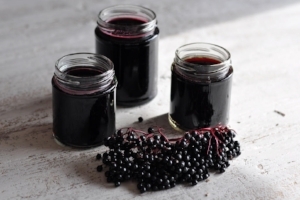 In this workshop, Community Herbalist Sarah Sorci of Sweet Flag Herbs will discuss identification and harvest, properties, and uses of elderberries, as well as common syrup additions like rosehips and astragalus root. Participants will enjoy a demonstration of syrup preparation, and take home their own bottle made with local raw honey and rosehips. Recipe will be shared as well.